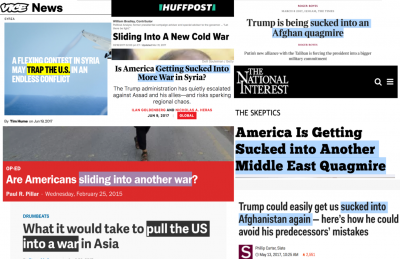 One of the most common tropes in US media is that the US military always goes to war reluctantly—and, if there are negative consequences, like civilian deaths, it’s simply a matter of bumbling around without much plan or purpose. This framing serves to flatter two sensibilities: one right and one vaguely left. It satisfies the right-wing nationalist idea that America only goes to war because it’s compelled to by forces outside of its own control; the reluctant warrior, the gentle giant who will only attack when provoked to do so. But it also plays to a nominally liberal, hipster notion that the US military is actually incompetent and boobish, and is generally bad at war-making. This is expressed most clearly in the idea that the US is “drawn into” war despite its otherwise unwarlike intentions. “Will US Be Drawn Further Into Syrian Civil War?” asked Fox News (4/7/17). “What It Would Take to Pull the US Into a War in Asia,” speculated Quartz (4/29/17). “Trump could easily get us sucked into Afghanistan again,” Slate predicted (5/11/17). The US is “stumbling into a wider war” in Syria, the New York Times editorial board (5/2/15) warned. “A Flexing Contest in Syria May Trap the US in an Endless Conflict,” Vice News (6/19/17) added. Why the sudden uptick in “self-defense”? Could it be because, as with the bombing of ISIS (and nearby civilians), Trump has given a green light to his generals to adopt an itchy trigger finger? Could it be Trump and Secretary of Defense James Mattis, who has a decades-long grudge against Iran, want to blow up Iranian drones and kill Iranian troops? No such questions are entertained, much less interrogated. 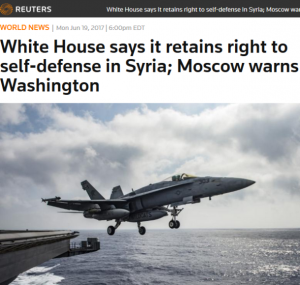 The US’s entirely defensive posture in Syria is presented as fact and serves as the premise for discussion. When US empire isn’t reluctant, it’s benevolent. Interpreting US policymakers’ motives is permitted, so long as the conclusion is never critical. Vanity Fair (12/28/16): No “stumbling” for Vladimir Putin. In contrast, foreign policy actions by Russia are painted in diabolical and near-omnipotent terms. 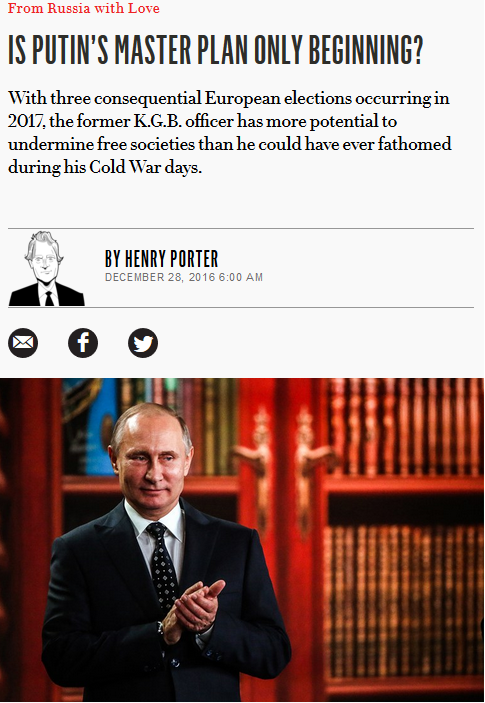 “Is Putin’s Master Plan Only Beginning?” worried Vanity Fair (12/28/16). “Putin’s Aim Is to Make This the Russian Century,” insists Time magazine (10/1/16). Russia isn’t “drawn into” Crimea; it has a secret “Crimea takeover plot” (BBC, 3/9/15). Putin doesn’t “stumble into” Syria; he has a “Long-Term Strategy” there (Foreign Affairs, 3/15/16). Military adventurism by other countries is part of a well-planned agenda, while US intervention is at best reluctant, and at worst bumfuzzled—Barney Fife with 8,000 Abrams tanks and 19 aircraft carriers. Even liberals talk about war in this agency-free manner. Jon Stewart was fond of saying, for example, that the Iraq war was a “mistake”—implying a degree of “aw shucks” mucking up, rather than a years-long plan by ideologues in the government to assert US hegemony in the Middle East. War, of course, isn’t a “mistake.” Nor, unless your country is invaded, is it carried out against one’s will. The act of marshalling tens of thousands of troops, scores of ships, hundreds of aircraft, and coordinating the mechanisms of soft and covert power by State and CIA officials, are deliberate acts by conscious, very powerful actors. Media shouldn’t make broad, conspiratorial assumptions as to what the bigger designs are. But neither are they under any obligation to buy into this mythology that US foreign policy is an improvised peace mission carried out by good-hearted bureaucrats, who only engage in war because they’re “sucked into” doing so.